Bring 1 cup water to a boil. Add bulgur and cook at a simmer for 12 minutes, until water has absorbed and bulgur is fluffy, stirring regularly. Let slightly cool, then place in an airtight container in the refrigerator until completely cooled. In a medium mixing bowl, stir together cooled bulgur, parsley, tomatoes, cucumber, lemon juice, olive oil, salt and pepper. Taste and adjust seasoning, if necessary. Refrigerate. Bring a large pot of salted water to a simmer (160-180 degrees). Add vinegar and stir to combine. Gently crack eggs into simmering water, one at a time. Gently scoop each egg with a slotted spoon to help keep them together. Let eggs cook 3 minutes, until white is set. Gently remove with the slotted spoon and lay them on a paper towel to dry off. 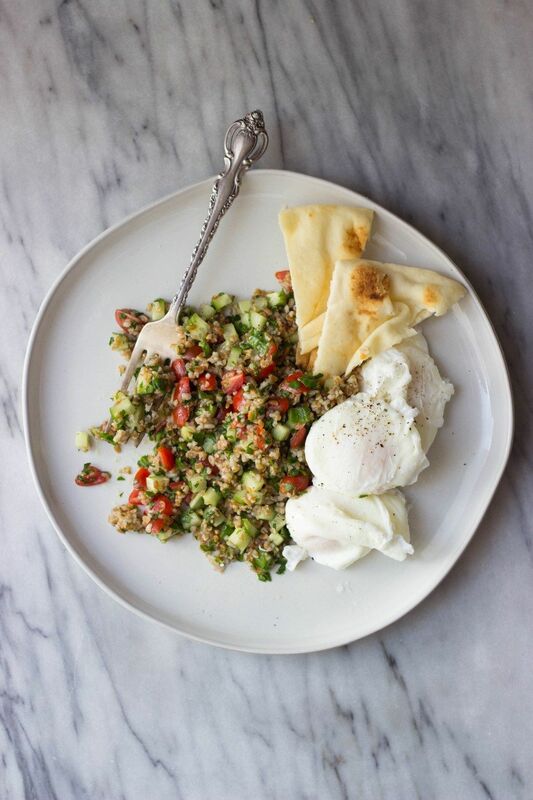 Scoop tabbouleh and poached eggs on plates and serve with pita wedges.